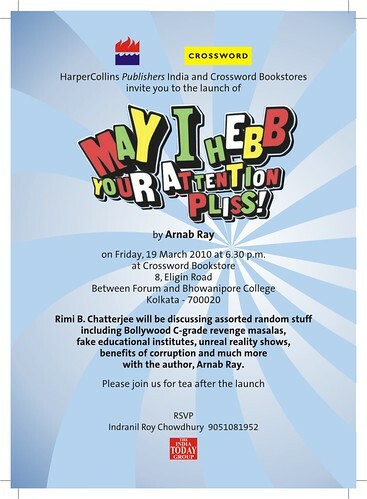 The “May I Hebb Your Attention Pliss” launch event in Kolkata is on March 19th at 6:30 at Crossword Elgin Road near to the place (Bhowanipore College) where Bipasa Basu studied. I will be in conversation with Rimi Chatterjee . Please feel free to attend and bring along a friend or two. And no need to RSVP as per above poster. Will you be having a launch event in Pune? Is there any event planned for Mumbai? I would love to come. Anyways, must get over my “lyad” and phataphat buy the book. Unfortunately events only in Kolkata and Delhi. Nowhere else. You have a book event in New Delhi (March 5, 2010 at India Habitat Center [6:30 pm]) and in Kolkata (March 19, 2010 at Crossword Elgin Road [6:30 pm]). Why not in my city? A: The decision regarding which cities to have events in is one that is taken by my publisher. Here is a secret though: greater the number of books sold, more extensive are author book tours. You get what I am hinting at—don’t you? – By God GB, you never miss the point!! aar ei cafe coffee day ta exactly kothay? asiatic society end or cemetery middle or park circus end? great launch yesterday – congrats! am reading the book! will comment after i am thru with it. So who is Nikhil Chalakkal? Another sub performance by Ganguly… I am just saying. Congrats GB. Must have been a great moment. Suffice it to say that I am really happy! :)And I certainly wish that I was there! BTW the gal moderating the event (Rimi Chatterjee) was looking a female version of Mr. Ponytail!!! does rimi now sport a ponytail, last time, she had her hair cropped short. MIHYAP – A great read in a long time, couldn’t resisit posting my appreciation on my fb status “…PG Wodehouse, R.I.P”. Arnab, the old order changeth…! Btw, is the Delhi launch over? Yes delhi launch was on the 5th.